The Basset Artesian Normand looks a little like a Basset Hound, but is lighter in weight. A short, straight-legged hound, its body is twice as long as it is high. Its head is dome-shaped and powerful with hairy cheeks. Its eyes are large and serious looking. Its ears are very long, cone-shaped, soft and pointed, giving the head a noble and beautiful appearance. The neck is slightly dewlap and the muscles are smooth with a moderate amount of wrinkles. The chest is round with a clearly visible sternum. The large, black nose protrudes slightly beyond the lips. The tail is thick at the root, but narrowing progressively, and carried with a saber curve. The coat is very short, bicolor: orange and white, or tricolor: orange, tan and white. Breeders prefer white feet. 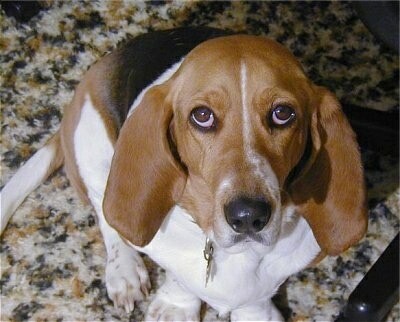 The Basset Artesian Normand is fairly easy to obedience train. Although brave and determined, courageous and headstrong in the hunt, the Artesian is gentle with children and makes a fine, trustworthy pet. They have a very deep bark and may bark loudly when strangers arrive, but will still give a warm welcome. Good-natured and obedient, he is valued as a companion as well as an excellent hunter. Many French owners embrace this dwarfish hunter and welcome him into their home as a member of their family. He has an excellent nose and loves to take off after an interesting scent, so be careful he does not slip away from you. They will get along nicely with other breeds; they live in packs in France. If they are socialized with cats and other household animals when they are young, they will get along with them as well. Owners should be firm, but calm, consistent and confident in their approach. To avoid behavior issues learn canine instincts and treat the dog accordingly, providing plenty of daily mental and physical exercise. 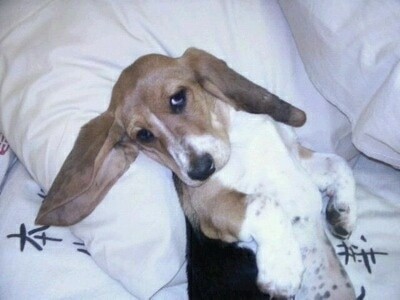 The long back of the Basset Artesian Normand is prone to disk disease. The Basset Artesian Normand is good for apartment life. They are fairly active indoors and a small yard will do. This breed needs long daily walks, but remember that it will take off after any interesting scent when it is off its lead. If this happens, put a piece of your clothing or something with your scent on it near where the dog disappeared and you will most likely find the dog in that spot in a few hours or at least by morning. The smooth, shorthaired coat of the Basset Artesian Normand is easy to groom. Rub a rubber brush over the dog's coat occasionally to remove dead hair. Shampoo only when necessary. Clean the ears regularly and keep the toenails short. 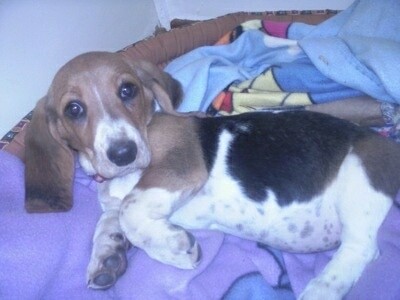 The Basset Artesian Normand is one of the six recognized French Basset breeds. Originating in Artois and Normandy, it dates back to the 1600s. Bassets are dwarfed, full-sized hounds, retaining the body lengths of their forebears, but with enlarged heads, shortened long bones, and larger joints. Their short stature allows hunters to follow them easily on foot. 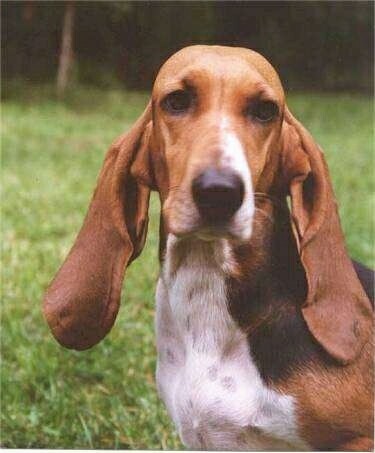 By the turn of the 20th century, the Basset Artesian Normand was developing into two distinct lines, straight-legged hunters and crocked-legged, droopy-eared companion and show dogs. French breeder Leon Verrier developed today's standard, which blends attributes of both varieties. The Artesian Basset needed straight legs that would neither hinder his speed nor drain his energy in order to work in unruly terrain, brush and briar. This handsome strong-bodied dog was developed strictly for utility, but because of its good temperament, also makes a good companion dog. It is used for hunting foxes and hares, sometimes in company with larger hounds. When the larger dogs are unable to penetrate the brambles, the Artesian Normand is ready to throw itself decisively into action. 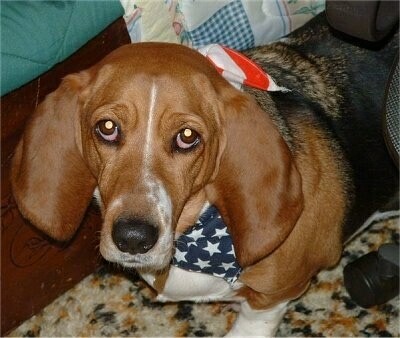 Like other bassets and terriers, it will go into lairs after its prey. The breed was recognized in 1911. "My dog’s name is Bambi. 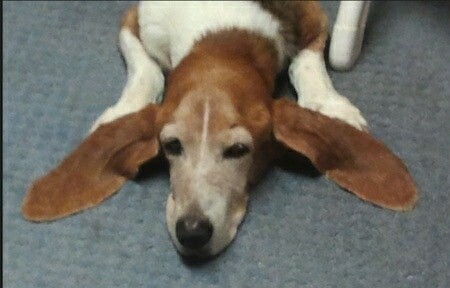 She is a Basset Norman. When the photos were taken she was still a puppy. She is a very friendly and playful pet. She loves her teddy and her rope. When we go to bed at night she will jump up against the bed and say goodnight and then run to the other side and say goodnight to her “daddy” as well. She will then run back to her bed and go to sleep. She got potty trained very quickly. She will wake us up during the night if she needs to go outside. Bambi gets a lot of exercise. We play with her every day by running around, hiding away and then she will look for us."